Edgar paced back and forth in the paddock, his course taking him from the spot occupied by the 342 Midnight to where the 362 should be parked. It was long overdue, yet he hadn’t heard any official reports of retirement. At long last, the wayward six-cylinder car arrived. It was downright filthy, and dented and scratched in several areas. Edgar folded his arms and grimaced. Its driver, Harland Jackson, climbed out without a word. He looked at Edgar, shook his head, and started to walk away. Harland walked away in search of water and a sandwich, despite Edgar’s protests. or, does it not matter? Thanks for catching that. I rephrased the rest of the sentense to be more coherent. Ready to start is the maginificent V12 Arkani T40, the number 387 car. It looks like masterpiece this. While the start from San Martino goes smooth enough, once the tarmac gives way to gravel, the car starts to suffer. Even before the true winding climb into the Arpenino Mountains start, the Arkani is on the very limits of control, ending up in the grass besides the road at least once as far as we are able to report. Time is lost here. What happens when you strap what is basically an early 30s airplane engine to even older 2-speed gearbox and bolt everything to a chassis with some body panels on it, and outfit it with a beautiful Parisian interior? You get a lot of noise that takes a long time to leave you behind apparently. The start of the Hades V16 Touring, a French-American exotic car from 1948 may be breathtaking in appearance and auditive presence but lacklustre in nearly everything else. Jimmy Fredricks might be an enthusiastic driver, but the Pomodoro 340 T '52 is simply one of those cars that becomes uncontrollable on the gravel. As stately as its exit from San Martino went, so awkward the skittish nature of the Pomodoro proved itself climbing the Arpeninos. Competing here more as a showcase model than as a serious competitor, Townsend Inc. claims: the Townsend Model 305 is powered by a 305 cubic inch V12; an atypical car from over the pond this. Reality is that the big V12 actually moves pretty swiftly out of San Martino and into the unpaved mountain roads. The grand reveal of the Epoch RPE 001, a true racing vehicle with a massive six litre inline six engine. 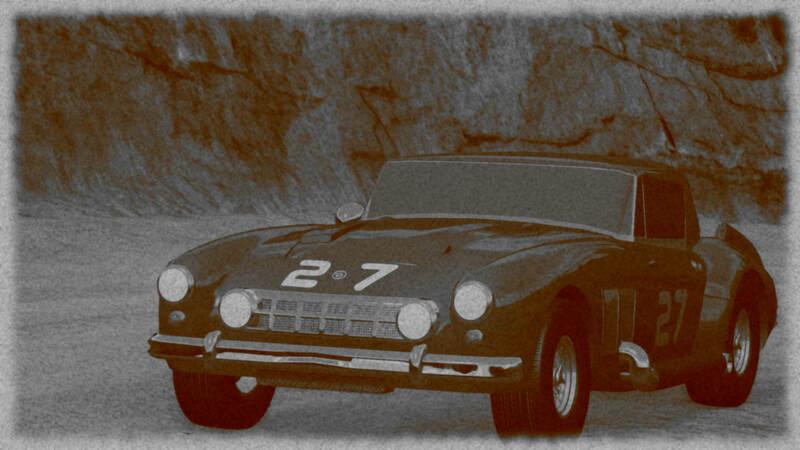 The number 27 car is dedicated race car, and as expected the narrow gravel roads can only be traversed diligently. Number 83 is a giant luxurious Sovereign 500 Luxe, powered by a massive 8 litre V12. This lumbering beast does not move daintily through the corner, but perhaps because of its mass, It can take the gravel agreeably enough. The Puttzalong Rod, an Inglese 51 with a Blue Oval engine – we reporters found no information on the nature or manufacturer of that engine – is yet another Puttzalong competing, this one driven by ‘Uncle’ Sam Washington and his sister, Olivia. The Juggernaut Automotive Kulkuri Special has a race-tuned V8 under the hood coupled to a fickle automatic 2-speed. 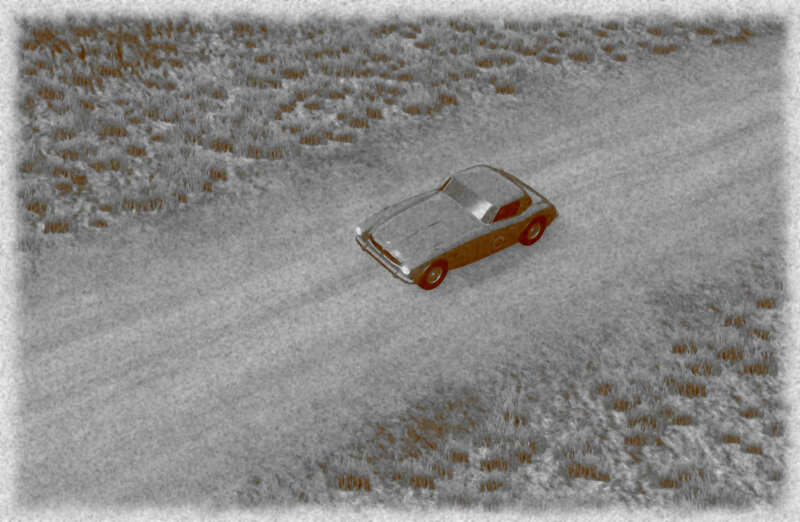 Trouble already starts early on when a sudden downshift causes wheelspin and drags the car off the road into rocks. Already significant damage to the car and we’re only just out of San Martino. This will be a tough one to survive. One of the most powerful sports cars on the market, the Nugetti Neyron. There’s not a lot of information on this particular entry. The engine is an intricate double overhead cam 4.4 litre V12. Despite all the power, first impressions outside of San Martino are that the car acts behaved on the gravel. The last of the Wisconsin Motors cars, the WM AeroMouse Panamerica Rocket, another specially adapted heavy duty baja racer, although with this one there have been concerns regarding reliability, as the power going to the 4x4 drive-system is significant. Stately, that’s the way to describe the BAM Regana 640 L with its 4 litre inline-6 engine; regal almost. And with those long gears that’s how it drives as well. Slow and stately, on a Sunday drive, rather than competing in a race. Granted, the drive over the gravel roads is perhaps slightly faster and more aggressive than you would while transporting royalty. Bizarre and frankly dangerous is what the pundits expect from this truck with grand tourer body shell, the Eagle 802 manages to look premium and rickety at the same time. Closing stage 1 is an airplane engine on wheels, with the Birmingham Nemesis V12. It is to be seen whether or not this contraption is an nemesis to anyone but the drivers inside. As was predictable, the sleek and powerful, but very road-focussed #387 Arkani suffers on the climb over the Arpeninos. 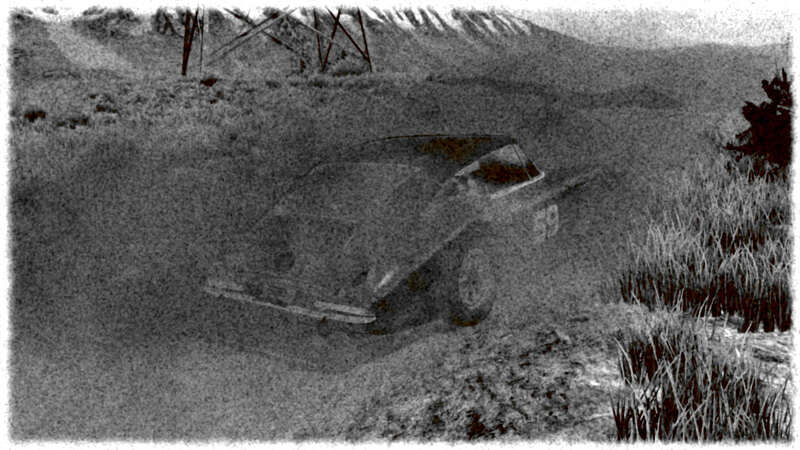 Damage at the second checkpoint – although light – shows the car has hit the guardrail frontally, probably while losing grip with the back wheels. No mechanical damage seems to be suffered. Twice. Twice the Pomodoro 340 T stalls. Twice. Twice it needs assistance from bystanders to get going again as the wheels simply kept spinning when starting unaided. The Townsend Model 305 is now encountering some difficulties in climbing the steeper parts of the gravel roads of the Fruipia side of the Arpenino Mountains. Pulling power is high enough to climb at a slow but steady rate in high gear, but trying to make pace will end up in wheelspin and loss of control. It is noticeable that the Epoch RPE 001 is rather untested. Frequent stops for mechanical issues and to let engine and brakes cool down are their part. The Puttzalong Rod, with flames painted on its front flanks as if it was a fighter jet, is actually turning out to be quite manageable a car to drive on the steep gravel roads here in the Arpeninos. Not a great start for the Falcon Motors Sparrow GT, the car with number 950 and the larger brother of the Sport GT. Clearly suffering from the same too long gears, the Sparrow struggles to get off the line, simply stalling twice until the driver aggressively revs the engine and slips the clutch. 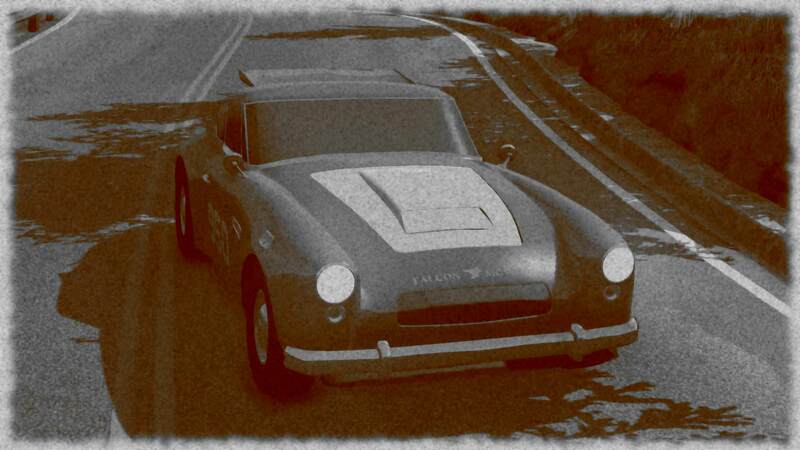 Powered up the mountains by that massive V8, the Aeros Badger 388’s only downside is its size in the tight twisty hairpins. As the roads carves its way higher in the Arpeninos, some issues with the suspension appear as well, necessitating a service stop. The engine of the Nugetti Neyron is a technological marvel, but it might be trying to be a bit too much ahead of its time. The result is technical issues. The climb high into the mountains is completed without any serious issues, although the car does hit a small post at the start of the Passo Senatore. As expected the WM AeroMouse Panamerica Rocket has issues putting down the power with the 4x4 system, the steering wheels losing control when full throttle is applied. It’s so bad that soon repairs are needed and the team decides to take it slow on the gravel. Slow, of course, is a relative concept, and some less off-road oriented entries might want to challenge that notion. The long gears of the BAM Regana 640 L are causing issues on the steeper parts of the climb on the Arpeninos. The driver needs to apply full throttle in first gear to get any power, but that in turn is actually a bit too much, causing the wheels to spin. Although the car in time manages to climb every ascent, it needs to stop regularly to let engine and clutch cool down. Somehow the company plans to make the Eagle 802 in that current form up for sale, marketed as a race car for the streets. With a giant 6 litre inline-6 truck engine and an army surplus 4x4 all-road chassis, I’m not seeing that working. In the end the biggest issues of this car is proving to be the brakes, or lack thereof. This has lead to a crash fairly early on. As expected the progress of car naught is slow. The large V12 sounds civil in the low revs that the Birmingham Nemesis V12 needs to hold to keep the wheels from spinning uncontrollably in the gravel. It might not be the flashing run the team had envisioned, but at least they are on top of the Arpeninos without any issues. Past the gravel, but into the ice as we reach the summit and turn back onto tarmac. This not a big improvement for the Arkani, although the #387 car stays out of trouble. It isn’t going very fast though. The car also isn’t helped with some mechanical issues. It seems seems to be the brakes are overheating on the descent. The Hades V16 does not like ice, or braking once it is up to speed. Hugo Laporte cannot keep this thing under control. Eye witness still discuss what was louder: the bang as it hit the guardrail, or the screaming and bleating of Suezanne Knightbridge. Some time is spent to ensure the damage is but cosmetic. This is a disastrous run by the Pomodoro 340 T. Jimmy Fredricks does not look behind the wheel. Driving weary and careful, he still spins out on slippery roads despite being released from the grip (or lack thereof) of gravel. Unfortunate low speed spin for the Townsend Model 305 breaks of a very fast run over the stage. But the car can continue with minimal time loss. No real issues, but no speed either for the Epoch RPE 001, as no risks are being taken (and even then, the back end breaks loose on occasion). The opulence of the Sovereign 500 Luxe is a sight never seen before for many of the spectators, many who have made the climb from valley villages in donkey carriage. This hand-crafted car is one of the most expensive vehicles money can buy at this time. The Juggernaut Automotive Kulkuri Special trundles on damaged and still struggling to get into the right gear for those slippery surfaces. The Falcon Motors Sparrow GT is all-in-all having an uneventful run, but needs the occasional stop to check the front suspension. The front-wheel drive system putting that much power from the nearly four and a half litre V8 to the steering wheels, clearly causes some reliability issues. Though stable on the ice, further technical issues as well size and the impact of the giant mass on the breaking distance form some handicap for the Aeros Badger 388 over the high peaks of the Arpeninos. Amazingly the slippery roads do not pose that much of an issue for the Nugetti Neyron although obviously it cannot use all power available in the V12. An additional service stop is made in Previ to prep the engine for the last stretch. Serious issues for the WM AeroMouse Panamerica Rocket throught the Passo Senatore. The car simply cannot find grip and spins out multiple times. The wheels spinning when ever the car wants to get going again. Things better when arriving lower and where the roads dry up, but a lot of time has been lost here. Despite the rather sedate speed of the BAM Regana 640 L the brakes fail on an ice patch and slam the luxurious car into the guard rail. Luckily it is quite sturdy and only cosmetic damage is suffered, although for a car like this, that is perhaps the worst. The rest of the sector is equally all but smooth, but no damage is taken. Despite the high power output, the Eagle 802 is actually quite tame, even on iced-up roads. The only event worth mentioning is a quick stop to check the engine oil. The Birmingham Nemesis V12 is standing still next to the road after a hairpin. It’s unclear what exactly is wrong. The car did hit a small wall earlier and spun out a few corners ago. 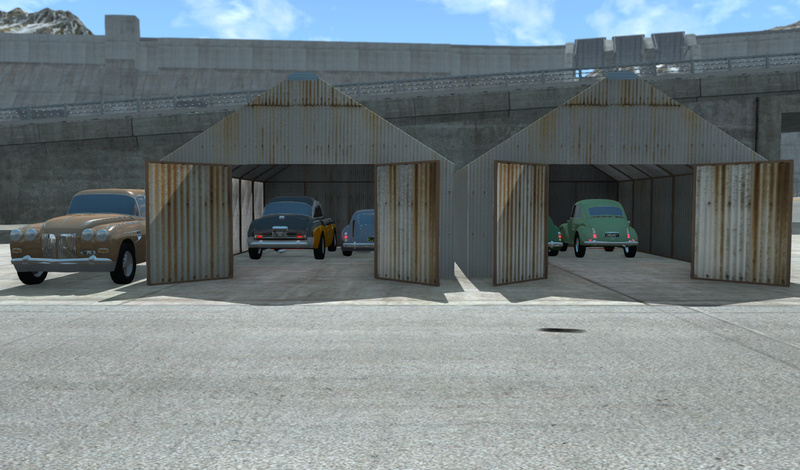 Not sure if it has anything to do with that, but apparently after some tinkering, the zero car can continue. The Arkani T40 is taking risks to make up for lost time, and while the car seems to handle brilliantly on this surface, the driver is less comfortable with all that power (and those rather lacking brakes). Going into a corner to fast, the car bumps into the guard rail. While the Arkani manages the continue, the front wheel axle is clearly damaged and pulling the car to the left. It is with near suicidal courage that the driver pushes the car to near its 200 km/h top speed on the Via Fruinia towards the finish in Fienna. The Via Fruinia is the real habitat of the big V16 Hades. Damaged though it looks, it rumbles past as a world war two fighter just before take-off. This is the stretch where the Pomodoro 340 T must make up time. But even that is too much to ask, as high speed instability makes Jimmy lose control once again, this time damaging the steering to make matters worse. This stage is one they will crawl out. 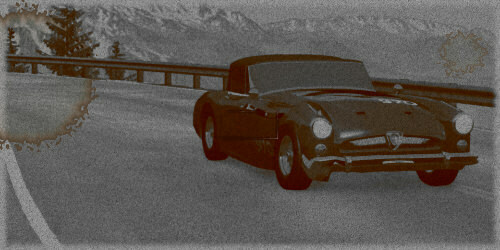 A showcase car, afterall, the Townsend Model 305, as it needs to stop along the road widing down towards the Via Fruinia. There is some knocking in the engine and the engineer needs to take a look. With a downshift, the Epoch RPE 001 straightens out on the Via Fruinia and unleashes the full power of those six massive cylinders. It is a remarkable car, if unstable on slippery surfaces, and maybe even the fastest car in this Corso. Young and Dawson have done well to guide the massive Sovereign 500 Luxe through this twisty stage. A crash for the Puttzalong Rod, heavily damaging the front left wheel. Though the Washingtons’ attempt to continue after some rudimentary repairs the wheel snaps horizontally under the car some turns later. In a last ditch effort to attempt to continue their race, they remove the wheel altogether. With three wheels they limp to the finish line, one of the rear wheels half-spinning all the way. It’s an amazing feat from the Blue Oval engine, running at high revs for such an extended period of time. However, it could not be, and they finish well after the allowed time for the stage. The Juggernaut Automotive Kulkuri Special was not having an enjoyable trip as it were, but added on top of the damage it took, technical issues raised their ugly head, and the team spent significant time working on the engine and that damned transmission to even reach the finish line. Amazingly, despite all the setbacks, they did set a time within limits. The bigger of the Falcons is better on the paved roads down to the Via Fruinia. This might in part be due to the contraption on top of the roof of the Falcon Motors Sparrow GT. The braking of the Nugetti Neyron is not on par with its speed. This makes the descent towards the Via Fruinia a tense affair. There are a few close calls and in one instance a sudden brake lock at low speeds turns the car around. It takes some time manoeuvring the sleek sports car back in the right direction. 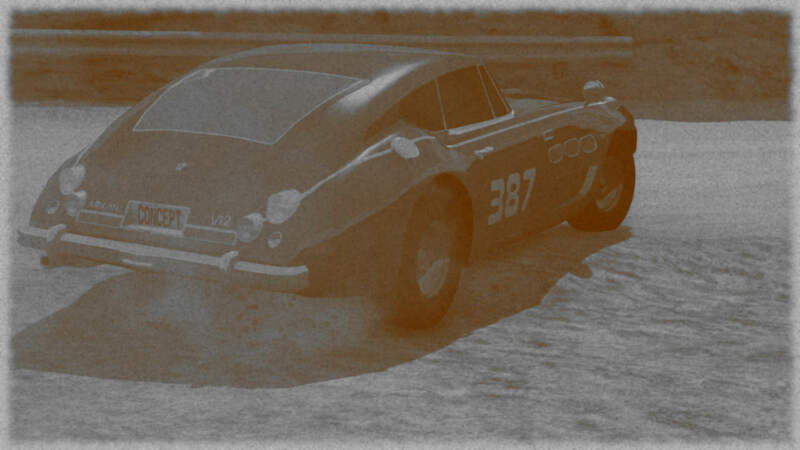 Before turning on the Via Fruinia, the Nugetti has a bout of understeer, causing it to trade paint with the guard rail. Something might have been damaged there, as the high speed run over the Via looks distinctly unstable. Nevertheless, the Nugetti reaches Fienna safely. Final stretch for the WM AeroMouse Panamerica Rocket with the big rumbling V8. It handles well with the low range torque in the hairpins, even without 4x4 on these paved roads. It’s not the fastest along the Via Fruinia, but it’s no offroad truck either, despite the abundance of truck parts used under the bodywork to deal with the engine power. Again, the large Eagle 802 is stable through the bends and twists and hairpins leading up the Via Fruinia. On the long straight roads though, the truck gearbox has the downside of short gears. And this lowers the potential top speed of the car significantly. Can the airplane engine lift off the car or not, the driver of the Birmingham Nemesis V12 seems bent on finding out. For those interested, we’ve also calculated the average amount of fuel used by each car in l/100km. I’ve not done this since my army days, this may be a bit rough. This is just to catalogue any faults we have with the cars, and in general about this country. So, this event has proven to not be the worst idea of Robert’s life. Good publicity, and all cars are here, more or less. We’re all currently in a hotel with some rusty sheds outside (photograph provided). The owner has been kind enough to let them all be stored here. Must be because of the Bramble he owns – not sure about the colour, but I like the body style – the estate was one of mine. Seaton and Lloyd weren’t best pleased with the Condo Sprint. Oh, they don’t mind front wheel drive, but they were less happy about the steering and gears. In both mine and Robert’s arrogance, we forgot about torque steer and the complexity of a 4 speed. Lloyd has done most of the complaining to us, while Seaton just sits there massaging his arms – I feel ever so guilty as a result. On the plus side, the car is fast, even though they did have to stop a few times, apparently. Tomos and Finn are having a less happy time in the Envoy. The standard engine is powerful enough, but the stalling characteristics are unpleasant at best. They’re blaming each other for their time (slower than every other car we have), but both agree that they should be ok if they take it easy on the hills. Its power has surprised other competitors, and hopefully some potential customers. Best make sorting out the stall issue a priority when I get back. Also, for some reason, it had blood on the front, but neither Tomos nor Finn will tell us what happened…. The best publicity for us has been the two Scots in the Bismuth 6. They’re not terribly fast (They’re slower than the Condo! ), but the design has surprised almost everyone they passed. I’ll have to hand it to Robert, I wasn’t sure about the fins, but they’ve proven very popular. Alasdair isn’t even that worried about damaging it anymore, as apparently ‘It handles like a dream’. I don’t plan to tell him the firing ‘threat’ was a joke until we finish the event, though. Keeps him humble. Why I let Robert drive is beyond me. The navigation notes got a bit damaged during a particularly icy section, although when your driver is whistling when spinning, I think that can be forgiven. We did get an applause for it, however. I swear he’ll be the death of me one day. May as well note the car misbehaved – making the Pan 4 more powerful has limited its hill climbing ability. Best make the on-hill modification standard when I get back. Perhaps shorten the gearing as well. I’ll leave it here. So far, we’re around the middle of the classification in all categories, and we’ve had no large accidents, so long may that continue. Note: in case of points draw, fastest time wins. 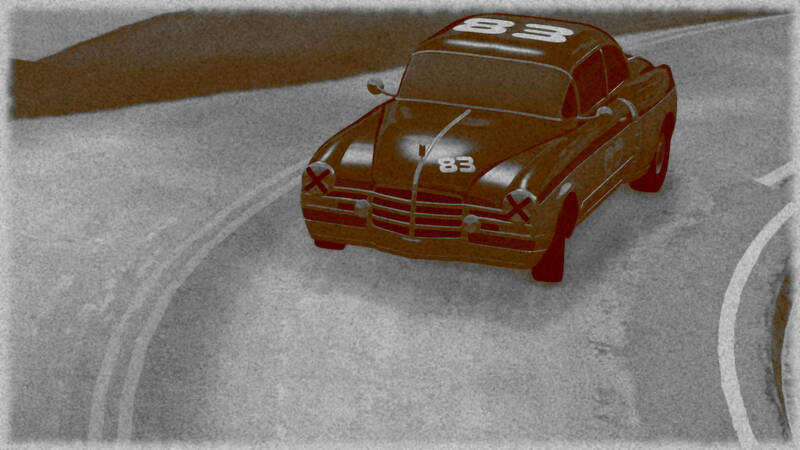 50’s-era racing is hard, dude. Suppose I should get to writing my RP. Honestly, I just can’t believe how great Eagle 802 performed. It was mostly designed to show the power of a high-displacement inline engine, and the gearing was set to low top speed to maximize acceleration and prevent going up to dangerous speeds. And as I can see it worked, because, judging by its performance, I can guess that it was the fastest car to climb the gravel section. I’m really regretting not submitting a 5th car, because that would have given Eagle Motors a chance for 1st place in Manufacturers Standing. Still, I’m glad that Eagles 112E and 202 performed exactly as expected. As for the 102, well… Let’s just say that mistakes happen. And slapping a race-spec engine to a mostly untested offroad truck chassis is one of them. “Get out of the way, you clueless nags!” Steffen shouted futilely, as the spooked horses stampeded across the road in front of him. 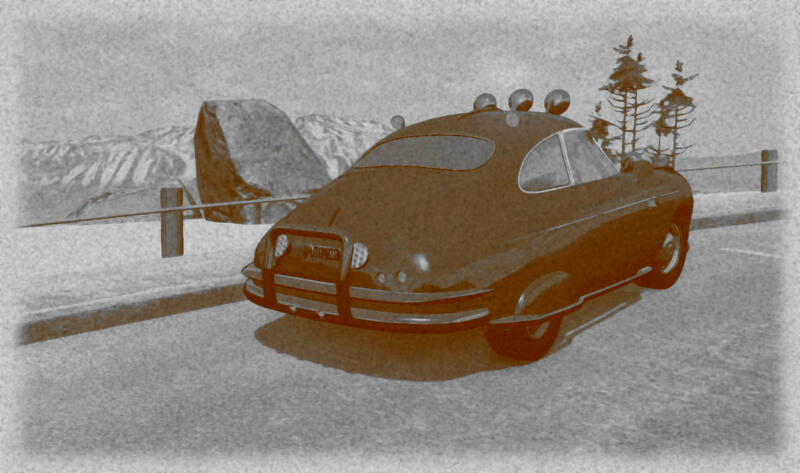 Impatiently, he revved the engine of his race car, the Bergmann Special, unleashing an ungodly torrent of noise, which only served to make matters worse. “Gott im himmel, these beasts are going to be the end of me!” he thought to himself as the visibly angry farmer ran down to the fence line, gesticulating angrily and cursing in Fruinian at the little silver race car. The commotion has attracted the attention of the residents of the village nearby, a number of whom are chasing after the panicked horses in an attempt to corral them for the poor farmer. Before long, the Bergmann Special is surrounded by a crowd of villagers, in equal parts angry and bewildered by the sleek, silver race car. Peering into the engine compartment of the FABEL, Ruud Kocken squinted a little as he examined the carburetor of the #26 car. 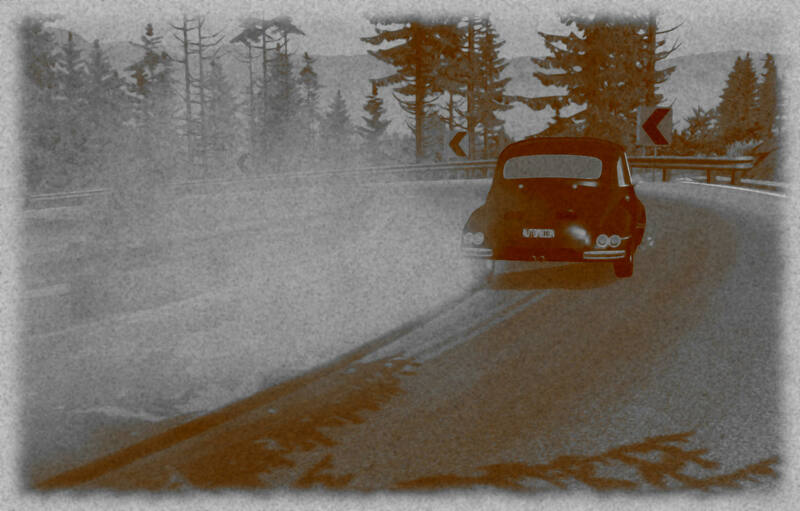 The Étoile 1400 struggled all throughout the first stage of the rally, not running particlarly well at any point, but well enough that the car still finished the stage nonetheless. Reaching in, he unscrewed the brass jet from the carburetor and peered at it intently. “Hey Franck…do remember what size jet did we put in before we left?” Ruud shouted to Franck Steunebrink, who was making an adjustment to the Étoile’s brakes underneath, trying to avoid a repeat of the scary moment the team had in the first stage. “Do you remember re-jetting the carb before the first stage? Because I can’t…” Ruud said. Franck slid himself out from under the car, squinting as he tried to remember if he did or not. “Can’t say that I do, to be honest. Do you think we forgot?” Franck replied. “I know we forgot…this is a 150 jet right here.” Ruud said with a smirk. Ettore Mazzanti picks up the phone in the local cafe, grateful that the owner availed its use to him to make a long-distance call. “Yes, hello operator, I would like to place a collect call please, long distance,” he said, in passably Fruinian. “What is the number?” the disembodied voice asked in the handset. “Mirano Italy, 6307, please.” Mazzanti replied. “Please hold while I make the connection.” The line went dead for a few minutes as Ettore smiled and shrugged at the cafe owner as he waited. The line came alive again as the operator re-connected. “What is the name of the caller, please?” She asked. “Yes, thank you.” the woman at the other end of the call replied. A click as the operator disconnected and the woman began to speak. “Ettore? Buona sera! come stai? How is the rally going?” She asked. “He’s just left for the day, I’m afraid…is there a message you’d like me to pass on?” Franca asked. “If you wouldn’t mind…we had a bit of a mishap, did some damage to the front left fender of the car; nothing serious, Pietro’s hammering out the dent right now, but these Fruinians don’t exactly have much in terms of parts to support us. Would you be able to have someone send along a new set of front lights for the car, to meet us at the end of the second stage?” Ettore went on. Within half an hour of shutting down the Sovereign, Warren Young and Herb Dawson had become instant celebrities in Fienna, the car having been mobbed by excited and curious bystanders at the service park. Having run a quick but uneventful stage, the two men found themselves with little to do other than some basic prep work, so they made the most of their time and were showing the excited crowd around the car, letting people sit in it and experience the opulent luxury of the 500 Luxe. 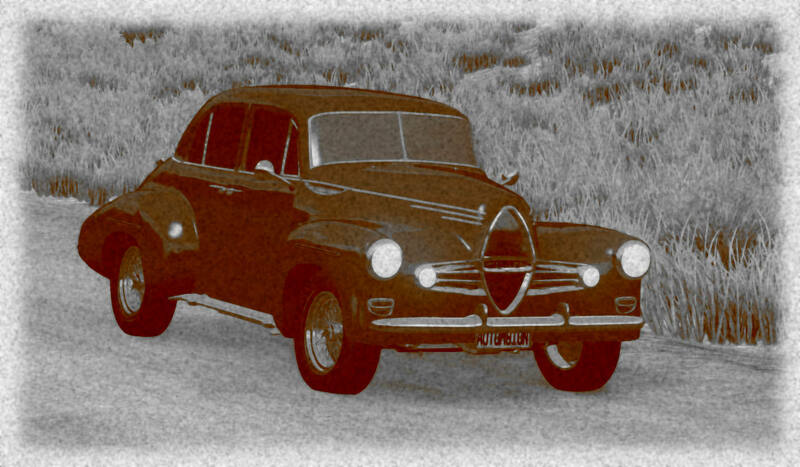 Herb smiled as a young schoolboy sat wide-eyed in the driver seat, barely able to see over the dash, pretending he was driving the big coupe on his own Corso di Fruinia. Before long, boy’s father hurried the lad out of the car and shook Herb’s hand, pulling him in for a surprise hug as he did. Meanwhile, Warren stood at the front of the car, explaining the various features of the Sovereign’s enormous V12 engine to a crowd of excited young men from the local technical university, all still in their overalls. Though there was a bit of a language barrier, Warren and the young men were able to come to an understanding, as the language of engineering transcends borders. -"Then why did you make the engine so powerful? And what exactly happened with the manual transmissions? the gearing was set to low top speed to maximize acceleration and prevent going up to dangerous speeds. Prevention of going up to dangerous speeds is hardly an issue when there is nothing but low speed corners (this is why the smaller engine sizes are so fast compared to the big brutes). And on the few stretches of open road, lifting off the throttle tends to be better for control than buzzing the limiter. I can guess that it was the fastest car to climb the gravel section. Actually, no, it was the 9th fastest in sectors 1 and 2 (with about 90% gravel). Heel-and-toe. Always match your rpms when downshifting to prevent losing rear grip.